Rs 27,000 crore project running through the length of 80 km has been proposed by the Kumaraswamy government. Residents say this Elevated Corridor may destroy several trees. Bengaluru: After the controversial steel flyover project proposed by the Siddaramaiah government in Bengaluru, current chief minister HD Kumaraswamy has proposed the Elevated Corridor to ease the traffic menace plaguing the city. However, many citizens have come together claiming the garden city's green cover is under threat. Several activists, environmentalists, and even children gathered together to protest against the Rs 27,000 crore project. Meanwhile, Kumaraswamy has said that this corridor would connect the north of Bengaluru to the south, making it easy for commuters heading to the Kempegowda International Airport. Prakash Belawadi, actor, activist, said the government has failed to learn from its past mistakes. "Earlier, we protested against the steel flyover and stalled the project. This Elevated Corridor will destroy umpteen number of trees. This is a nasty project that will harm the environment," he said. 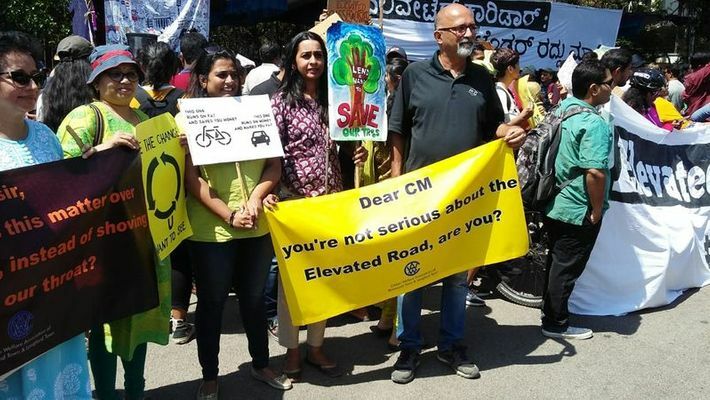 Mobility expert Ashish Verma and Vinay Sreenivasa of Bangalore Metropolitan Transport Corporation (BMTC) Bus Commuters Forum and some of the other activists joined and expressed their views. They said the government could instead focus on public transport, keeping in mind the recent Budget that offered nothing for the BMTC. "This kind of project will never have any impact in solving traffic issues. Instead, it will lead to increasing the traffic. Even in Mumbai, a similar initiative was in place where plans were sanctioned, but has it eased the traffic?" asked Verma. "The Elevated Corridor cannot solve traffic issues. The BMTC is a poor man's transport and the government has ignored it completely. Earlier, when Anand Rao Circle flyover was being constructed, 400 trees were chopped, but has it solved the issue? This corridor will meet the same fate," Vinay Sreenivasa said.